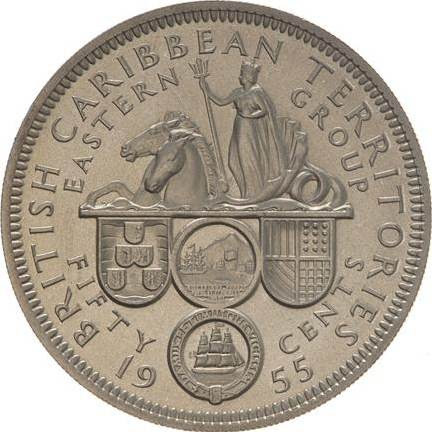 British Caribbean Territories, Eastern Group: 50 cents, 1955. Romania, 20 lei, 1944. Gold. The shields of Romanian counties in Transylvania. Basically cities (lower denominations) and provinces (higher denominations); will look that up. Stay tuned. (Edit) Here we go; the names listed for each denomination are in alphabetical order. I just stumble on this issue. Indeed: the lower denominations show the shields of the provincial capitals, while the higher denominations show the provincial shields. 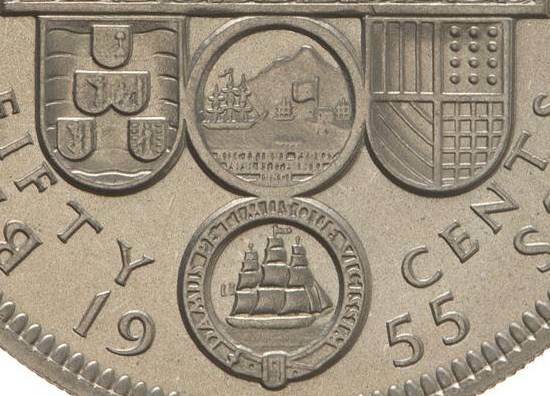 The missing provinces (Luxemburg, Hainaut and East-Flanders) were depicted on the 50 centimes 1939 KM#118, but the striking of this coin was interrupted because of the second world war and only a few coins reached circulation. As Christian already stated, Belgium counts nowadays 10 provinces because the province of Brabant (capital brussels) was split into the province of Flemish-Brabant (capital Leuven), the province of Walloon-Brabant (capital Wavre) and the Federal Capital region of Brussels. Poland, 100 zloty, 1966. Millennium celebrations of Poland. 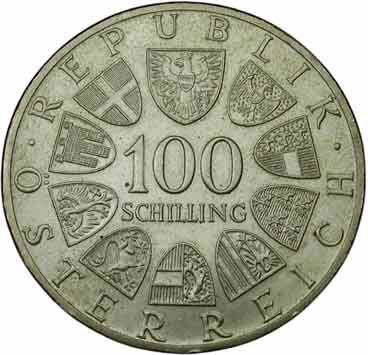 The now defunct commemorative 100 Schilling coins of Austria always showed 10 shields or coats of arms on the obverse, to represent the nine states of Austria and the country itself. 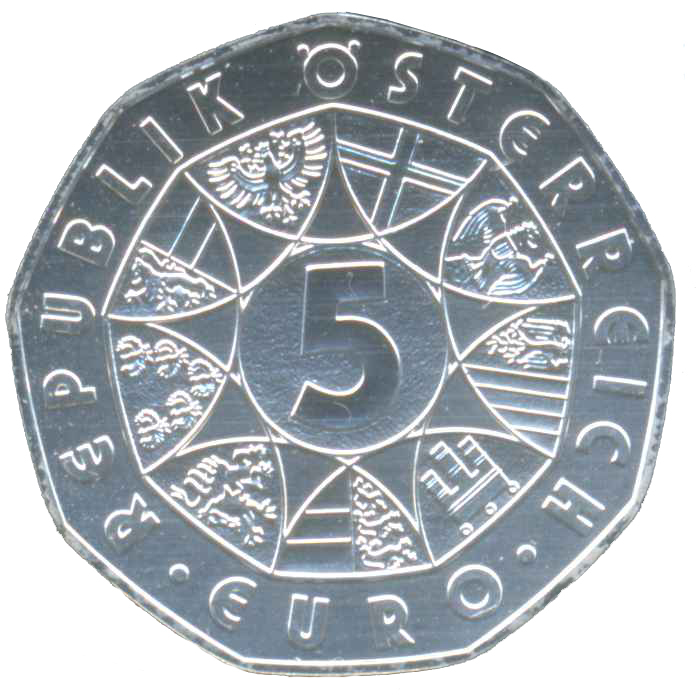 Austria uses a similar device on its collector 5 euro coins. The major difference between those two Austrian types is the presence (or not) of the federal CoA. The early commems of the Second Republic, issued between 1955 and mid-1964, had the shields of the nine states only. Between mid-1964 and 1988 they used the nine plus the federal eagle. 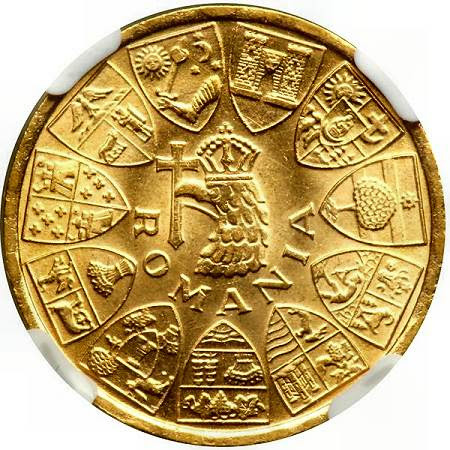 (Austria used a few different obverse designs for its commems too.) In 1996 the circle of nine state shields was introduced again - first for the bimetallic 50 schilling coins, now for the 5 euro coins.